When most people think of mountaineering, images of Mount Everest typically come to mind. 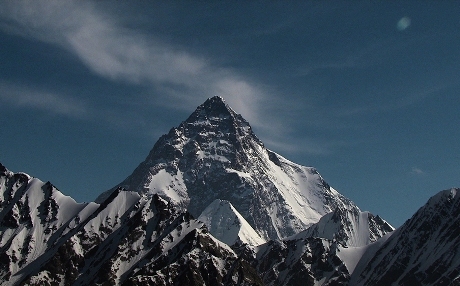 But for serious climbers, Everest is a cakewalk compared to Earth's second highest peak: K2. There's a reason this Himalayan monster earned the nickname "Savage Mountain": one out of every four that attempt to reach its summit never make it down alive. Nick Ryan's The Summit recounts a notorious 2008 K2 expedition, wherein 11 of the group's 24 climbers lost their lives, exploring the fatal events that transpired. The harrowing story is told through a series of talking head interviews from the survivors and actual footage from the expedition, stitched together with eerily realistic re-enactments of the event. The result is a suspenseful account of who perished, when it happened, how it occurred and, most importantly, why. The unwritten rule for mountain climbing is that if you get into trouble, you shouldn't expect a fellow climber to risk their life to save yours, yet we learn of Irish climber Ger McDonnell's attempt to save three other climbers, which resulted in his death. McDonnell's demise subsequently becomes a focal point of the film, as the survivors share their account of what occurred — some were close to McDonnell and their stories paint a picture of a heroic man, while others were distanced and portray him as foolish. Various other missteps were made during the expedition that may have directly, or indirectly, instigated the other deaths. Different angles are presented through the series of interviews, which lead to finger pointing and a glimpse of hostility among the various survivors. While the idea of listening to such a number of people recount their memories may sound grating, the footage of the mountains and the re-enactments put viewers alongside the action and allow an opportunity to experience what it must have been like for all involved. Throughout it all, Ryan offers incredible insight into the mindset of climbers, ranging from their initial motivations to the challenges they face and the plethora of scenarios that can go wrong. The extreme altitude is a factor that's cited throughout, emphasising how mental function can be compromised via oxygen depravation. It most certainly ties-in with how the climbers' brains would have been functioning, calling into question the reliability of first-person testimony.